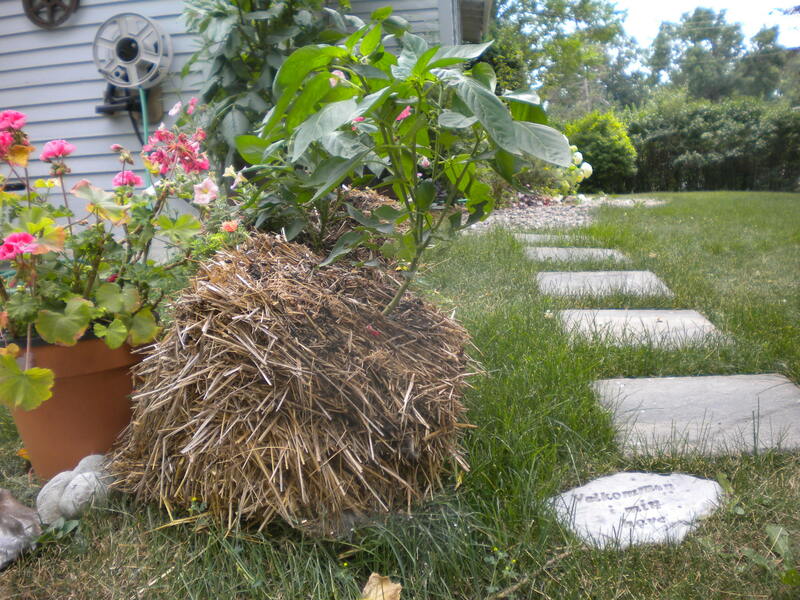 When I first reported enthusiastically on the experimental fun of gardening in straw bales, I promised an update. To recap, it is a process created by a Minnesota horticulturalist, Joel Karsten who was the keynote speaker this year at the Otter Tail County Garden Day. Consequently the entire county was hit by bale buying frenzy within hours of his talk. 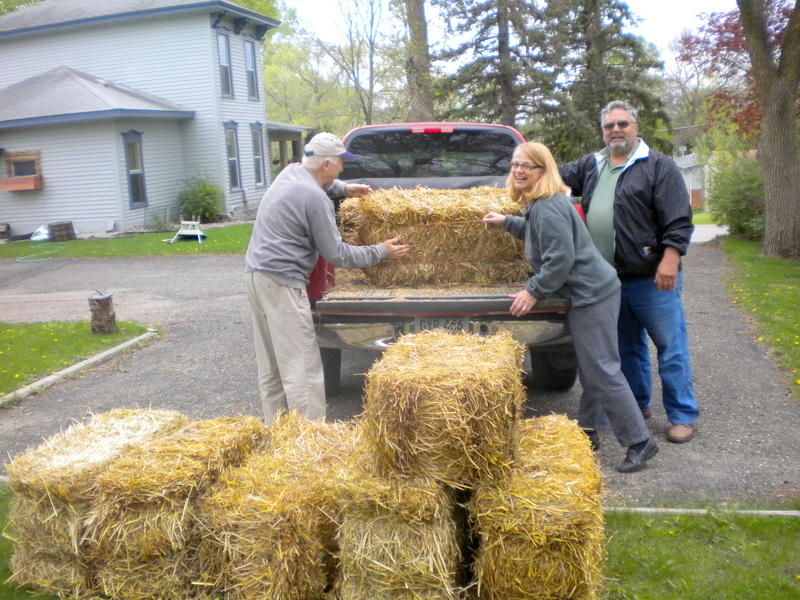 I succeeded in my endeavor, only because Cousin Rick came to the rescue from North Dakota, his truck loaded with 10 bales just for us. 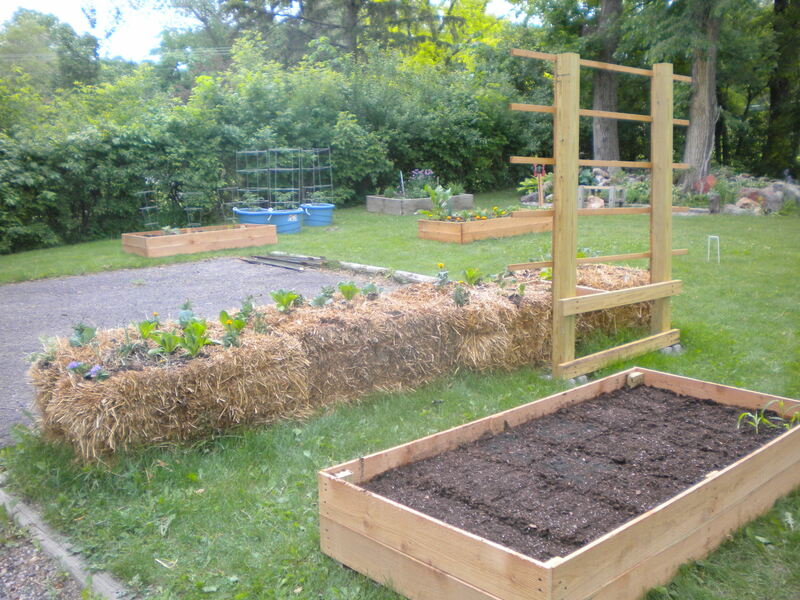 Mr. Karsten’s premise is that straw bales provide multiple plusses. No special soil or fertilizer, a growing medium so rich when it breaks down that fields of mushrooms magically appear, no stooping down or over, mobility (someone reportedly moved his garden from one lot to another in the middle of summer! ), and need for less water. Aside from the need for less water, I concur. And we’re still at Mt. Faith, so the bales are still in one place. In one place – but seriously SCHLUMPING! Evidently when the straw breaks down into rich sorta-loam, it also shrinks drastically in size, which isn’t a problem in itself, but it tends to collapse on one side leaving a bell pepper, for instance, hanging on for dear life and subject to the ravages of gravity. SEE BELOW! Also, I’m not convinced – however many mushrooms I may have grown inadvertently and not-withstanding – that the resulting growing medium is all that great. 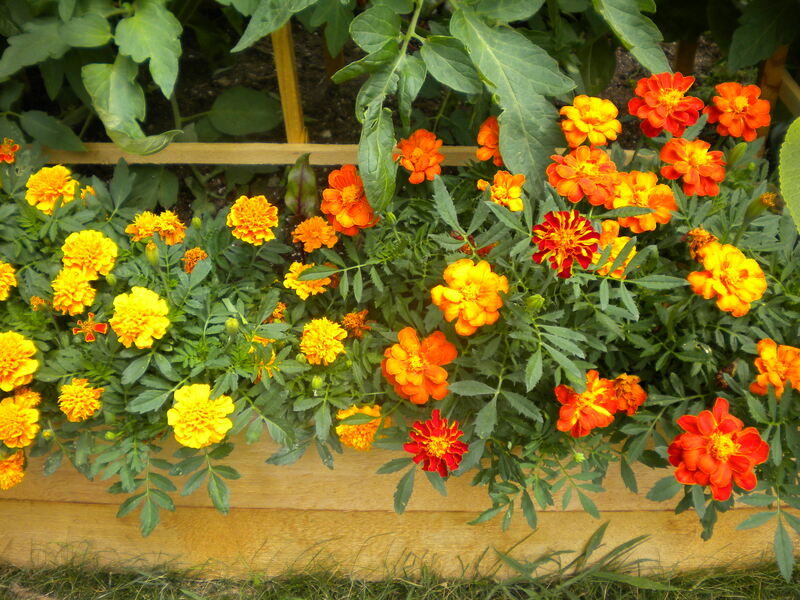 I regularly plant marigolds around my veggies as I am convinced that their stinky smell just might ward off critters. 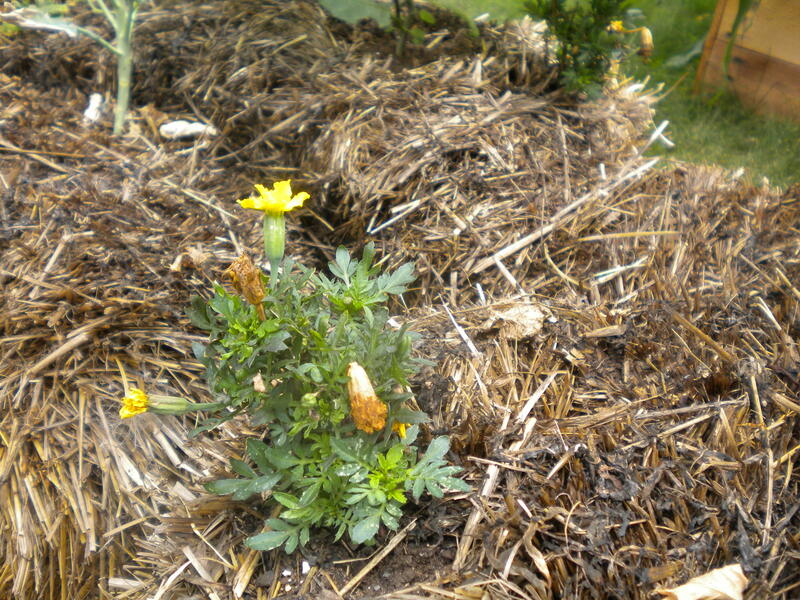 Witness one of the few ratty remnants in a bale which was planted the same day as the plethora of blooms in my raised bed. I can’t show you the ratty lettuce or kale or brocolli in contrast to the ones in the raised beds, because I’ve already yanked the suckers out in disgust. I’m sorry Mr. Karsten. You gave such a rousing presentation and it’s just possible that it’s my fault for not sprinkling with the right amount of nitrogen in the first 12 days or watering too much or too little, but I’m signing off next year. 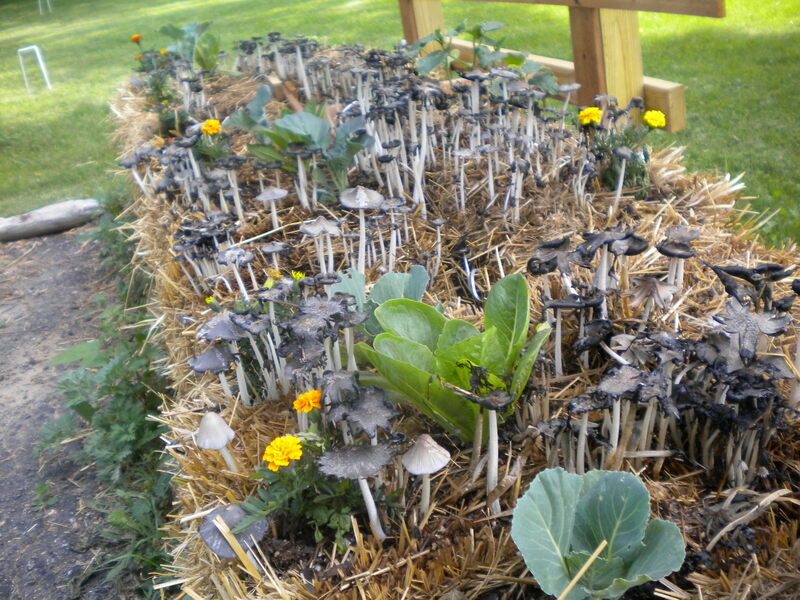 The good news is that it was a fun experiment and better yet, I have a ton of good mulch for the winter. P.S. : Any “bale-ers” out there? Thoughts? This entry was posted in favorite things, food, Gardening, minnesota life. Bookmark the permalink. So are those mushrooms edible? 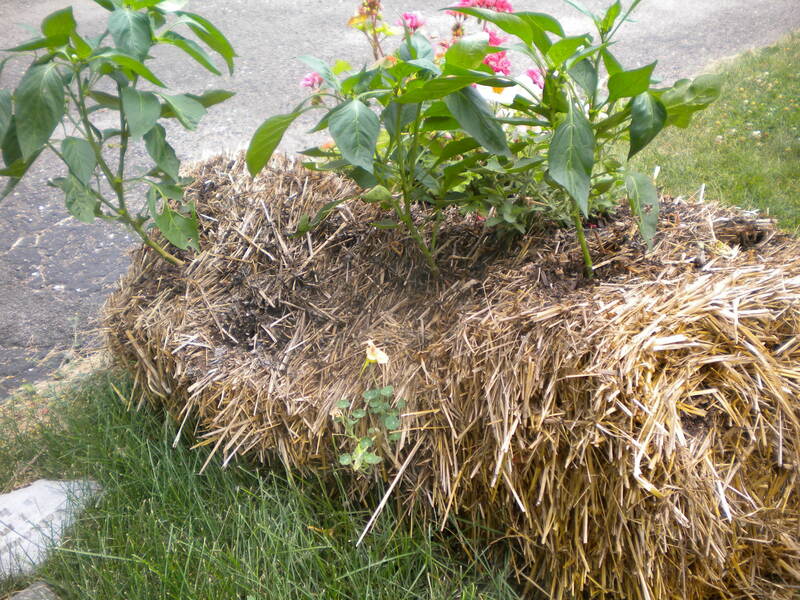 I’ve never tried this but since I’m gong to have a bunch of straw next year, I just might try something with them. But since most of my straw will be loose, I’ll use them around the strawberries first. I will be curious how it turns out for the garden, too, and looks like I’ll be using it there, too.